So, as I said, my Wings of a Dream was finished just in time for the wedding. 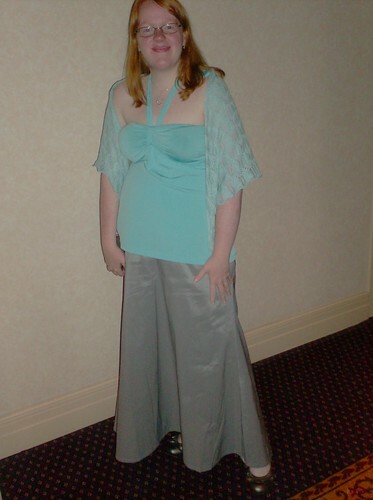 I had a lovely time and I think my outfit was fab, if I do say so myself. The shawl turned out a good size for me. 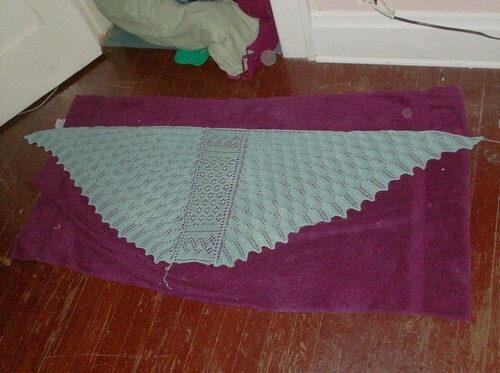 I don't like huge shawls, and my Wings of a Dream is smaller than the pattern-as-written in two ways: I cut down the center section so it wasn't as long, and I used size US2.5 needles to create a pretty solid fabric out of the thin lace yarn. The yarn is wonderful, by the way - It's Colourmart cashmere silk, 2/36NM but doubled, which created a nice regular lace weight yarn. It's soft as anything and with a bit of a sheen. My 150 gram cone was 1500 yards, and I still have a ton of the cone left over - I've started an Icarus shawl for my mother with the remainder of the cone.